Guest article written by Leah Callender-Crowe, a PhD student at the University of Manchester and a member of the Voice of Young Science network. 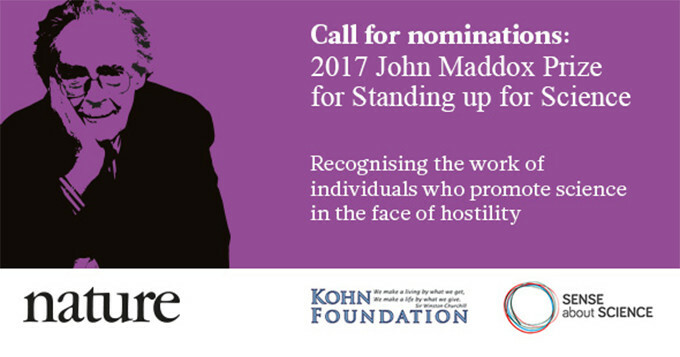 Do you know someone who stands up for science and evidence on a matter of public interest, who’s faced difficulty or hostility in doing so? Science isn’t a popularity contest, and sometimes the results aren’t the ones we’re looking for, or they shine a light on issues that people don’t want to see. Debates can turn sour and polarised, creating a vicious cycle where standing up for free scientific thought becomes and even more of a daunting task. Some consequences that these individuals and others have faced for speaking out have included lawsuits, death threats and personal abuse. The prize is named in honour of Sir John Maddox FRS, himself a fierce defender and communicator of science, editor of Nature for 22 years and a founding trustee of the charity Sense about Science. The prize is a joint initiative of Nature, the Kohn Foundation and Sense about Science. So if you know of someone who has shown courage in the face of hostility while communicating on difficult topics and engaging in scientific debate, researcher or not, you can nominate them by filling out this form. You can read more about the John Maddox Prize here. The closing date for nominations is 31st of July 2017. Winners will receive £2000 and be announced at a reception in London and in Nature.